Originally intended to be the female counterpart to Superman, this DC Comics heroine has served as the alias of several powerful women since the 1950s. Most notably is Kara Zor-El, the cousin of Superman, who also escaped the destruction of Krypton by traveling to Earth via spacecraft. Appearing in a variety of animated series, movies, live-action television shows, and video games, she has become a popular and enduring character in her own right. 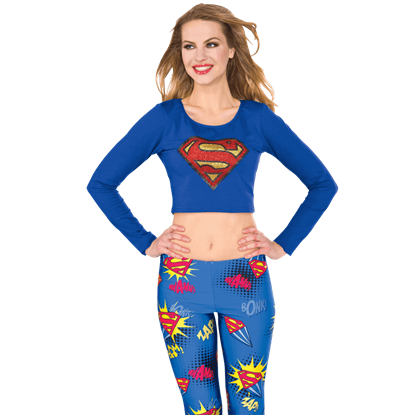 At Superheroes Direct, we bring fans of this Kryptonian heroine a variety of Supergirl apparel and collectibles, including several t-shirts in womens and unisex cuts featuring Supergirl, as well as a Supergirl costume t-shirt, complete with cape. 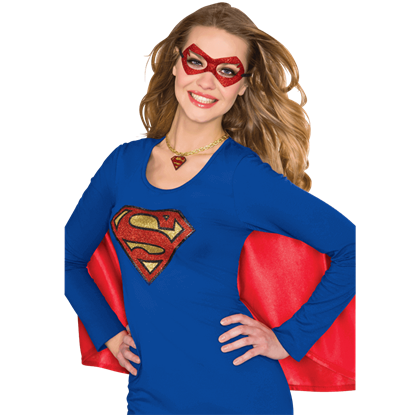 Try our full Supergirl costumes, available in both adult and childrens sizes, to fully emulate your favorite superheroine. Our playing cards, robes, and other high quality collectibles all make excellent gifts for any fan of Supergirl. Like many heroes, Supergirl is known to wear a cape as part of her super suit. 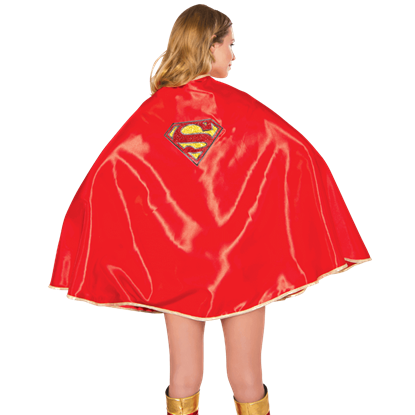 Made of a bright red, satin-like material, the Adult Deluxe Satin Supergirl Cape is a sleek and stylish way to take your superhero look to the next level. The Adult Supergirl Boot Tops assist in presenting the image of DC Comics superhero, Kara Zor-El from head to toe. While this pair of boot covers matches the classic uniform, it also goes well with a variety of stylish costumes. This stylish accessory goes just as well with the classic uniform as it does with an outfit created by the fashion savvy fan. 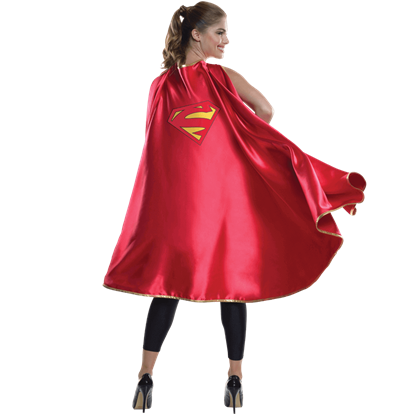 Complete your epic portrayal of Kara Zor-El with the Adult Supergirl Cape draped about your shoulders. No superheroine look should go without the proper accessories. The Adult Supergirl Choker features a glittery Supergirl logo charm on a short, gold colored chain, perfect for adorning the outfit of any Kryptonian crime-fighter. Create your own version of DC Comics Bombshell beauty, Kara Zor-El or show up as your favorite superhero in party style. By adding the Adult Supergirl Costume Corset to your cosplay closet, your options for roleplay are limitless. Dress in the style of DC Comics Kryptonian superheroine when you wear the Adult Supergirl Crop Top. 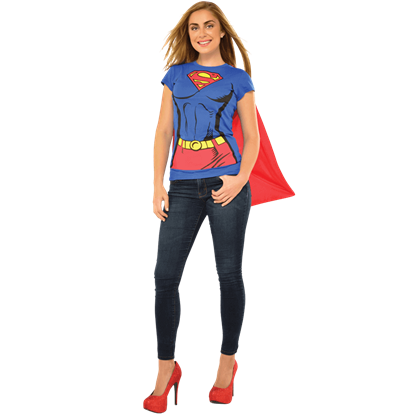 This officially licensed costume shirt is great for combining with other Supergirl gear for a fantastic costume or themed look. Kara Zor-El, cousin of Kal-El, is the last survivor of Argo City, which was on Krypton. She and Kal-El, better known as Superman, have similar abilities. 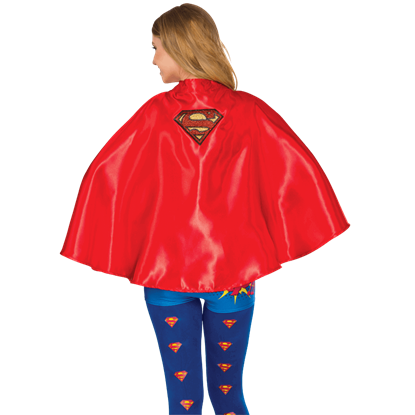 Wear this Adult Supergirl Deluxe Cape for Halloween or any costumed event. Captivate the Halloween crowd and mesmerize the vile supervillains with your beauty at the next party. You will be both alluring and heroic when you make the Adult Supergirl Fishnet Overlay Corset a part of your stylish ensemble. 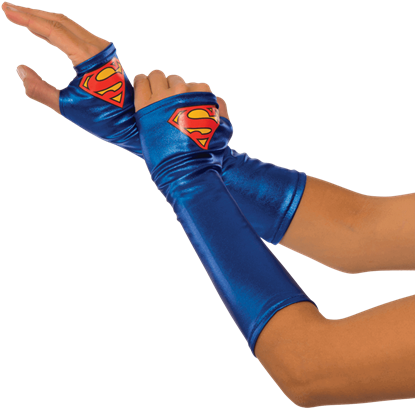 Step into the role of DC Comics Bombshell or take the part of Ame-Comi girl with the Adult Supergirl Gauntlets. Kara Zor-El has appeared in many forms, offering a great variety of outfits for the fashion savvy cosplayer to create. Add an additional touch of mystery to your portrayal of Kara Zor-El with the Adult Supergirl Mask. Fellow partygoers will guess at your true identity while you ensure that this Hallows Eve is filled with adventure and excitement. Follow the latest trend and arrive at your next costume party in the guise of your favorite DC Comics superhero, Kara Zor-El. 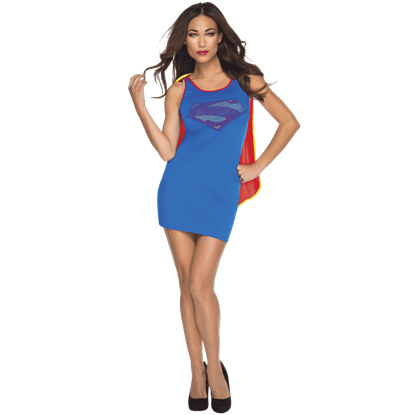 The Adult Supergirl Rhinestone Tank Dress Costume is sure to attract the eyes of your fellow partygoers.